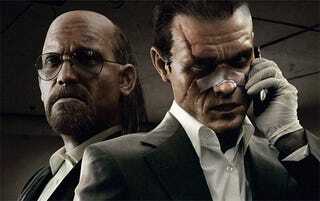 Eidos sequel to the 2007's Kane & Lynch: Dead Men, likely titled Kane & Lynch 2: Dog Days and likely teased in this fascinating but brief video, may be giving your eyeballs more Kane and Lynch than you bargained for. According to a potentially spoiler-filled e-mail—yes, spoiler alert in effect!—from a regularly reliable tipster, Messrs. Kane and Lynch will be on the run entirely in the buff for one of the game's levels. That's for the whole level, supposedly. How does this happen? According to our tipster "they wind up naked because in the previous level they get ambushed and are about to get sodomized." Oh, my. If that's the kind of information that gets your blood pumping, you may be similarly pumped to hear that Kane & Lynch 2: Dog Days will feature online co-op multiplayer for the entire campaign, letting you run for dear life—naked—with your friend. It could get awkward. It will be interesting to see how this is pulled off, if true, as we doubt that Kane & Lynch will exhibit the modesty of, say, Raiden's naked adventures in Metal Gear Solid 2. We've reached out to Eidos PR to see if they have any confirmation on this information, but this sounds like the kind of info they'd prefer to cover up until closer to release.